How did we get this book: ARC from the publisher at BEA. I’ll also preface this review by saying that it is a very different book than Code Name Verity – epistolary style aside – but for those differences, it’s actually a more powerful and more important book. It is perhaps unfair to compare this book to Code Name Verity, which is, as Ana says, an internal novel about two best friends, spies, and brilliant, unexpected lies. 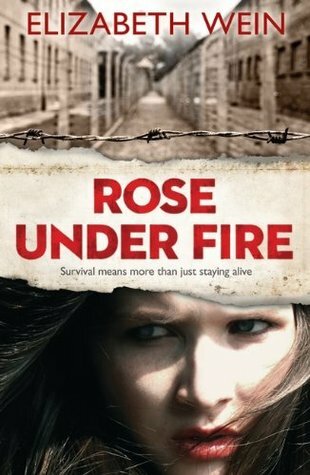 Rose Under Fire is a very different creature, without the huge walloping twists of the former novel, and more of a straightforward retrospective record of Rose’s life before and after Ravensbrück. 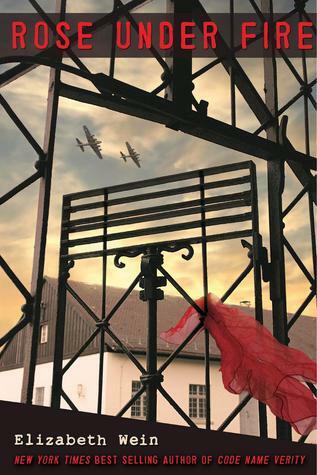 It’s an important story, and one that is written with Elizabeth Wein’s beautifully skilled hand – I have to agree with Ana in that the iterations of Rose before she tips that doodlebug and is captured by the Nazis is an entirely different Rose that is imprisoned and beaten in Ravensbrück. And that Rose is a different one than the terrified survivor, who fears her newfound space and freedom (to the point where any loud noises, like a telephone ringing, terrify her). The Rose that ends the book – the one that is reunited with her fellow friends and survivors, who goes to medical school following the war and after she has survived surviving – this is the strongest, most powerful Rose of them all. And I deeply appreciated and loved this character, so very much – moreso, I think, than the heroines of Code Name Verity. Praises all said, the one key area where I felt that Rose Under Fire faltered, however, is in its epistolary narrative (granted, this perhaps is my own stylistic preference and nitpick). Rose narrates the story through her journal before Ravensbrück as a daily diary, but after she escapes and survives the concentration camp, the narrative switches to a long, very detailed account of daily life and her encounters over that missing year. To me, this feels more than a little contrived (to be fair, I had the same issue with Code Name Verity and the plausibility gap of a hardened Gestapo officer allowing a young captured spy to write so much in a journal day after day of being imprisoned and divulging nothing of importance). I also was not a huge fan of Rose’s poetry, although I appreciate the importance of lyricism and poetry to the character. Personally, it wasn’t to my taste, but this is completely a matter of personal taste and not a failing of the writing at all. The only other thing I will say about this book actually has very little to do with the book – and perhaps this is more of a personal reflection, or fodder for a ponderings post than it is a fair commentary on the actual story itself. (This is code for me saying, please feel free to tune out now!) Still, I feel very strongly that something must be said: Rose Under Fire is one hell of a book. It’s a powerful, emotionally resonant historical novel about remembering and about surviving, and I truly appreciate and value that. That said, it’s also a story about a war that ended nearly 70 years ago. It’s also a story narrated by a beautiful, young, privileged, white girl who literally flies into a terrible situation. Please understand that I am not disparaging or arguing against the value of the rich canon of literature about the Holocaust, or the set of circumstances facing heroine Rose. I am simply saying this: there are so many wars, atrocities, even genocides that have happened in the last 70 years, and that are still happening now. Those truths and those stories are hardly represented today – much less in YA literature. And perhaps this doesn’t belong here in this review, but it’s something I am acutely conscious of, and I vow to do as much as I can to change this. Because I am inspired by Rose’s story and by this book, because I think it’s important to talk, to remember, and to experience that truth through storytelling, I vow to read and review books from other, more contemporary wars, from characters and authors other than that of the white, the privileged, the American and Western European. (I think I’ll start with Never Fall Down by Patricia McCormick, or A Long Way Gone by Ishmael Beah – if anyone has any other suggestions, please, please let me know.) And that is all. This book left me an emotional wreck. I was a tearful mess and I believe that the book haunted me for at least a week. It is so hard to believe that people had to endure such horrible situations (and they still do today in many countries). I did love the depiction of acts of passive resistance and the camaraderie despite the conditions. I did understand the reluctance of the victims to speak out at the trials. Many of the Holocaust survivors could not talk about the atrocities they had seen. While the book is being marketed as a companion book, I do feel that Code Name Verity should be read first – because of Maddie. It is unfair to compare this to VERITY, but both — for different reasons — have a huge emotional impact. I really liked what ROSE had to say about surviving, not just in the moment, but After. I skimmed most of the poetry, but what I liked more than the poetry was Rose being a poet and how in many ways that saved her, gave her a voice, but my favorite part? She went to med school. Because poetry wasn’t the only part of her, or all of her, and it illustrates also how war changed her. Hmmm. Sounds powerful, but I still haven’t read either, maybe because I am Polish myself, and I think I’ve heard enough about this type of stuff (for now anyway -Polish history is particularly rich in getting screwed over/hated on (to understate it) . . all the Polish historical war movies I have seen =already too many by the time I was 13). One small point about the last paragraph: many Eastern Europeans and Holocaust victims are/were white, of course. There’s a bit of a trend for Western society (among my/our generation in the blogosphere anyway, and not everyone of course) to imply (or at least focus on) that only POC are victims . . ya, not quite. Really, anytime there’s a need for resources (whether human or land-based), someone will be oppressed, and they will use any damn excuse to differentiate their group from the other one (I mean, many Eastern Europeans have a pretty similar appearance, to some extent. That never stopped anyone.). Anyways, I don’t want to step on any toes, (and I agree with/admire your goals) because of course people will champion the issues occurring in their own countries/continents first and what interests them/what they consider important in today’s time. I really only know some European history b/c I happen to be Polish myself. But being white and similar looking to Germans and Soviets did not stop either country from what they did to the Polish (in the recent past, ie/ in still living memory). I don’t read these types of books at this point but a movie recco: Katyn -about the massacre of Poles by Soviets in 1940. Recommendation: an older one, but DEOGRATIAS by JP Stassen is an incredible, harrowing graphic novel (of all things!) about the Rwandan genocide. Without getting the slightest bit graphic (in the other sense) or depicting violence in a titillating fashion, it manages to evoke the context, aftermath, and full horrors of the massacre, not only upon the victims, but upon those who perpetrated it. Also recommend anything by Joe Sacco, although I think that his work is usually classified as Adult rather than YA. I am half way through this book so far, and at the moment, I’m loving it. I don’t think I will compare this to VERITY because even if I am halfway through it, I think Verity was much much more better and captured me more as a reader emotionally. One thing I will definately say is that I think Wein took the feedback she got for Verity on board really well, because there were many negatives in Verity which are not in Rose. I read Code Name Verity and Rose Under Fire as part of the Carnegie Awards, and I can see that all the negative things I wrote for Code Name Verity are no where to be seen in Rose Under Fire. I’m in my 50’s. I think it takes a while for fiction to catch up to current events. . I’ve been interested in WWII since I was a young reader, but growing up there was not a lot of fiction about it. I reread Anne Frank many times because that’s all I could find. It seems like WWII fiction has exploded in the last decade or so.